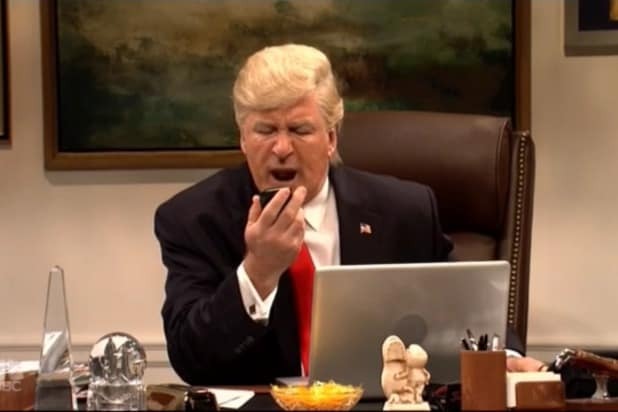 Alec Baldwin’s Donald Trump opened up the first new “SNL” episode in three weeks with a speed-run through recent Trump-news, with Baldwin as POTUS reading a prepared statement specifically to prove that yes, the president can read. As soon as he was finished reading the statement, Baldwin’s Trump immediately congratulated Putin, just like the real Trump did, despite a real-life note reminding him not to. Trump then handed the reins of the event to the Baltic leaders while he zoned out, completely bored. When asked about whether he was worried his policies are ruining America, Baldwin’s Trump finally leveled with the nation.